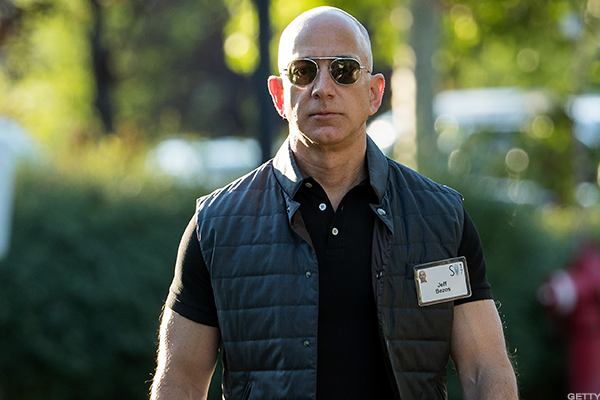 What Could President Trump Actually Do to Amazon and Jeff Bezos? Trump took to Twitter Wednesday morning to attack Amazon, whose founder, Jeff Bezos, owns The Washington Post, a newspaper the president routinely accuses of "fake news." Fresh from bipartisan criticism over comments equating Nazi and Klan followers with those who rallied against them in Charlottesville over the weekend, President Trump attacked Amazon.com Inc. (AMZN - Get Report) in a Tweet on Wednesday morning, claiming that the shopping website's growth has hurt U.S. retailers. "Amazon is doing great damage to tax paying retailers. Towns, cities and states throughout the U.S. are being hurt—many jobs being lost!" Trump tweeted, shortly after 7 am EST. The broadside against Amazon comes as The Washington Post, which is owned by Amazon founder Jeff Bezos separate from his company, has continued to report on Trump's comments about the violence in Charlottesville that led to the death of a 32-year-old woman, Heather Heyer, who was killed when a car allegedly driven by a white supremacist plowed into a crowd of demonstrators. Trump has routinely portrayed The Post as peddling unfair coverage, or to use a favorite term of the president, "fake news," despite its reporting having been matched or followed by numerous other news organizations. In April, one of its reporters, David Fahrenthold, was awarded the Pulitzer Prize, the most prestigious award in journalism, for revealing that many of Trump's claims about his own philanthropy had been exaggerated over the years. The early-morning offensive against Amazon raises the question of what the Trump administration might or could do to subvert one of the most successful U.S. companies in recent decades. 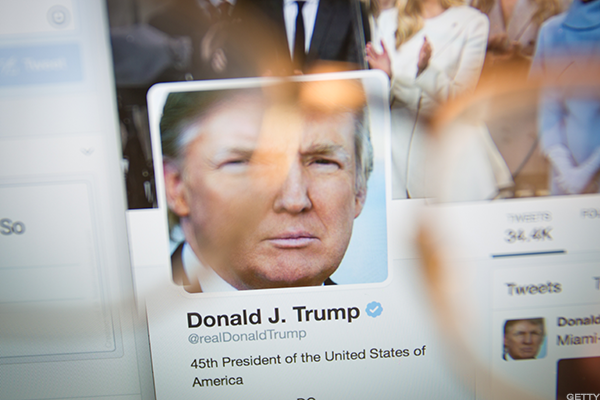 Earlier this summer, Trump used Twitter to label Amazon a monopoly, suggesting that the online retailer be investigated for anti-competitive practices at odds with the Sherman Antitrust Act. U.S. governments have used the Sherman Act to try to break up companies they alleged had used predatory practices to exploit monopolies. In 1998, the federal government sued Microsoft Corp. (MSFT - Get Report) , charging that the software maker had engaged in anti-competitive practices by bundling its Internet Explorer web browser with an operating system that had evolved into the industry standard on Intel-powered computers. Yet unlike the government's case against Microsoft, Trump's attacks against Amazon are shrouded in the politics of red states versus blue states, and Bezos' ownership of The Washington Post. For more than a year, the Post has broken dozens of stories on the Trump campaign's ties to Russia, his firing of former FBI Director James Comey and his false claim that former President Barack Obama wiretapped him. Trump, though, has struck back, insisting that the Post is being used by Bezos to protect Amazon from higher taxes, or even an antitrust investigation by the DOJ. While the matter of taxes was dealt with here, the issue of whether Amazon is exploiting a monopoly over certain markets is much harder to establish. One thing is clear, Trump sees Amazon and The Post as a single entity, tied together by Bezos. As he has done for months, the Republican president labeled the newspaper's work "fake news" despite wide acceptance of its veracity and supporting reports from numerous other news outlets. Leaving aside the political context of Trump's accusations, suing Amazon for antitrust violations would require meeting a difficult and daunting set of criteria, said Diana L. Moss, president of the American Antitrust Institute, a non-profit organization that promotes competition on behalf of consumers and businesses. The bar for proof in antitrust cases is much higher than in Europe, which succeeded in suing Alphabet's (GOOGL - Get Report) Google, something the DOJ has yet to attempt. "It's a heavy lift," Moss said in a phone interview from Washington. "You have to prove that it's a monopoly, and that the monopolist has used its market power to extend or maintain that monopoly to the detriment of competition. There would have to be strong proof from market participants that Amazon engaged in exclusionary practices, and the government would have to be pretty concerned about its conduct in many of the markets that it participates in." Antitrust law requires evidence that a company has engaged in anti-competitive, exclusionary or predatory pricing that may have led to higher costs for consumers, or a loss of sales at competing companies, said Amy Ray, a partner at Cadwalader, Wickersham & Taft, who specializes in antitrust matters. Such was the case in a series of largely unsuccessful lawsuits waged against Amazon by book publishers. Watch: Did Amazon Make a Mistake Saying There Are No Antitrust Issues With the Whole Foods Deal? A case against Amazon is made more difficult because it isn't simply an online retailer selling products that it manufactures, like a Target Corp. (TGT - Get Report) or Sears Holdings Corp. (SHLD , she said. Instead, Amazon is an online platform where thousands of companies sell their products, leveraging the website's global popularity to grow their own revenue. "There have been allegations of Amazon being a loss leader, especially with respect to books," Ray said. "But Amazon is basically a conduit for getting those other businesses, who are retailers themselves, products out to their consumers. Amazon is showing the consumer, here's the best price to find what you're searching for." Amazon and The Washington Post weren't immediately available for comment. For the DOJ to mount an investigation against Amazon, Attorney General Jeff Sessions would have to decide that the agency has the interest and expertise to pursue the case. Yet the department, like other federal agencies, has struggled to fill top government posts amid scandals and firings, making it less likely that it would invest large amounts of resources on a case that could take multiple years to build. Exacerbating matters, Sessions has been weakened in recent days after repeatedly being chastised by Trump for having recused himself from the government's investigation into whether Trump colluded with Russia to sabotage the campaign of Democratic nominee Hillary Clinton. The current attorney general for antitrust, Andrew Finch, holds the position in an acting capacity. Even if Trump really wants the DOJ to consider suing Amazon for antitrust violations, his own tweets could damage the government's case given that such lawsuits are supposed to be free of politics. Under President Obama, the Federal Trade Commission investigated whether Google had violated antitrust statutes despite close relations between the company and the Democratic party. Were Trump's Justice Department to wage an antitrust case against Amazon, the president's critics as well as the company itself would likely charge that such a probe was payback for The Post's reporting. "It would add a layer of murk and distortion to what is supposed to be an independent process by the antitrust agencies," Moss said. "Political motivations for enforcement of the anti-trust laws really have no business in our system. Interference by the White House or any politically motivated stakeholder deprives consumers, innovators, and the business community of due process." Microsoft, of course, was subject to years of due process. According to one account, the company spent 21 years fighting antitrust battles with the U.S. government. Microsoft was nearly broken-up in 2000 until a court settlement two years later led to a consent decree that restricted some of Microsoft's practices. As for Amazon, politics wouldn't necessarily disqualify the DOJ from mounting a case, Ray says. If an investigation can be shown to be warranted, and the Justice department is willing to allocate the personnel for the task, Amazon could be sued by the federal government, regardless of the difficulty in winning such a legal battle. "I wouldn't take his tweets to be directly relevant to whether independent antitrust enforcers would decide to bring a case," Ray said. "It's just that under U.S. law, it's just very difficult to bring successful unilateral conduct, exclusionary, predatory conduct cases to court, and win them." Editors' pick: Originally published July 27.